Finally, Rangasthalam is a regular story shown in a unique way by director Sukumar. Rangasthalam, the first work of Sukumar with Ram Charan, has already been creating a huge buzz at the box-office. The makers announced that it's a period drama that happened in a village in the 80s. 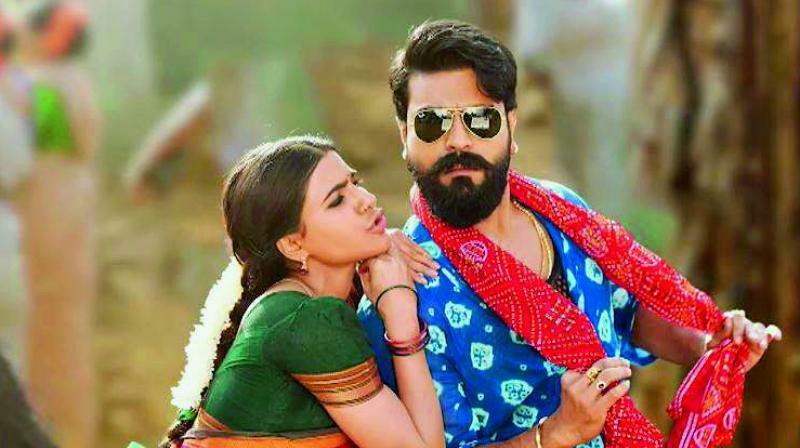 Chitti Babu (Ram Charan) has partial hearing loss but lives a happy life in Rangasthalam, a fictional village in Andhra Pradesh. He is good at heart and falls in love with Rama Lakshmi (Samantha) who lives in the same village. Phanindra Bhupathi (Jagapathi Babu) is the unopposed chief of this village since the last three decades and no one dares to go against him. The Co-operative Society runs by the village chief's people charge high interests from the people, showing false accounts. The other good side about Sukumar’s films is that they have technical brilliance and this film too falls under the same category. The village atmosphere, the rustic look, the ambience etc. are stunning. He simply brings back the rural life to the current era in this film. He has made the village life look more realistic in the film. Sukumar also uses the narration in a very clever sense. The film starts with Chitti Babu saving the local MLA from a major attack and then tells the story of his village. The protagonist’s hearing loss is used very effectively by the director in humourous and emotional scenes. The only issue is the long duration of the film. Apart from this, it is another Sukumar mark film with interesting scenes, songs and a surprise climax. When it comes to performance, the film belongs to Ram Charan. Till now, Ram Charan had done many commercially successful films, but Rangasthalam is one which reveals the brilliant actor in him. He has engrossed himself as the character. It is not that easy to play the role of a visually challenged person but he looks completely natural. Jagapathi Babu has once again proved himself. He is an overall asset to the film. Samantha has completely turned into a village girl and this is going to be another feather in her career. Anausya is a big surprise in the film and she too has come out with flying colours. Aadhi Pinisetty has supported the other cast well. Brahmaji did a great cameo. For Prakash Raj, it is another easy character role. Pooja Hegde sizzles in the special song. Music director Devi Sri Prasad always gives better music and background score for Sukumar’s films. Two songs are really nice and Devi has once again showed his talent in background score. Ratnavelu, one of the finest cinematographers, actually captures the entire village atmosphere in a beautiful way, especially Godavari and the surrounding areas. Ramakrishna and Mounica, the two productions designers, they should be appreciated for their excellent art work. Finally, Rangasthalam is a regular story shown in a unique way by director Sukumar. Though the second half drags a bit, you can still watch the film once. This film belongs to Ram Charan who is well supported by others.